This is the story of how two Honduran women came to the United States with an asylum, becoming two immigrants in this country with our daughters and son. Being an immigrant is not an easy task. It is to confront a different culture and a social-economic and political dynamic, especially when you have to develop skills and abilities to enter the job market. It also places you in conditions where you are reborn in a reality of disadvantages and survival, facing a new language that is different to one’s native language. To understand and assimilate our new reality took a long time, between weeping, anger, laughter, inventions, love and disaffection, we managed to return to our main purposes and dreams. One day we sat and reviewed our knowledge, experiences, skills, feelings and passions; we asked ourselves what is it that we do well and we love doing it. There were many answers and we took a step back and we considered the main one: to validate our degrees and study even more to obtain the licenses that would allow us to enter the labor field. During 2012-2014, we validated our studies and obtained our licenses in the State of New Jersey to launch our project: A Holistic Center. From there we started asking ourselves more questions, such as what else did we need? Where would we install our dream Spa? How would we do it? We were faced with internal challenges and economic ones. 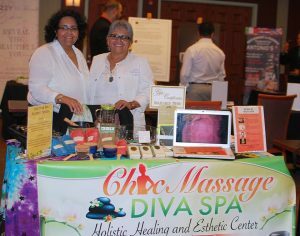 In June of 2015 our dream came true a holistic center Chic Massage LLC. DBA Diva Spa. This process of entrepreneur women has required internal strength, dreams, and security that if we are able to achieve our purposes. During this process we had our daughters and friends supporting us every step of the way. We are a working team that flows from the energy of love, compassion, and gratitude. We want to express the importance of our own history. Blanca Dole and Ana Centeno.